25 Jan Moroccan family Did you know about. 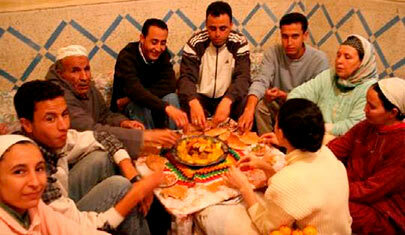 Moroccan family: Did you know about? Moroccan family: Status and tradition. The family is absolutely sacred in Morocco rather than contemporary Western cultures which are losing their traditions and customs. In the West we are “individualized” in Arab societies a person is, above all, a member of his community. Of course that nuclear families often excel by the union and fraternity, always led by men, followed by women, which in recent decades have gained some ground in society, despite Muslim custom of old, related to discretion, reserve and restraint regarding the female presence in the daily lives of everyday life. In this regard, older women are more empowered in families. Families living in the medina courtyard houses they inherited from their ancestors: the riads. Detached from the family home it is something frowned upon even among neighbors. The celebration of “Aqiqa” (Baptism Moroccan), or the seventh day the baby is born, is a festival that is particularly important in social and family life. Preparations for newborns vary from region to region of the country. Being a predominantly young country, the elderly are well regarded because of its limited presence in homes and are often heads of families. In that regard, the value of women is also paramount in families. Today Morocco has undertaken a changing family structures of considerable importance, incorporating legal, especially in regard to women’s rights.It has more women themselves have struggled to his condition became truly human condition and protected by the law been.